februari 2011 video dieren4you Kat_Expo Show, Fijnaart, Denzel & Falko are the stars!! 02-12-2010 Meulicats Milla Moirai has her own page !!!!! Meulicats Milla Moirai, U1 and nominated BIS 3-6 mnd. S*PartyCats Glenfarclas (Falko), U2 6-10 mnd. 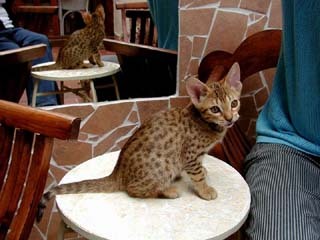 Expected kittens Chiara & Barwon and Brandy & Barwon in June. 31-01-2010 MEULICATS OCICATS in the snow new video!!!!!!!! 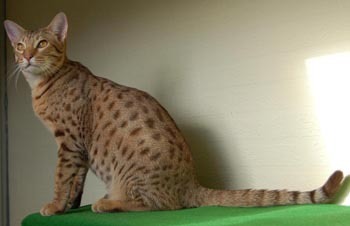 18-09-2009 kittens born Meulicats Denzel & Orchidee van Ermelinde the new Abysinnian Ocicat line information. 10-05-2009 new videos kittens Brandy & Chiara playing together video 1 and video 2!!! 20-02-2009 Cattery Meulicats in the spotlight, Mundikat Magazine February 2009 click here. Susy on the frontpage!! 11-02-2009 Kittens of Chiara & Barwon last week of March. 30-01-2009 Today we received the testresults of Ocicats Chiara, Denzel, Barwon & Brandy PRA DNA tested (Laboklin Germany), testresults are clear/normal!!!!!! 29-12-2008 Today we've got the results of testing our Ocicats Chiara, Denzel & Barwon on HCM & PKD in De Wagenrenk (Veterinary specialistic center) at Wageningen, the results are negative!!!!! 14-11-2008 our dearest Nero died a sudden dead he is no longer with us we will miss him very much!!!! 11-11-2008 Meulicats Dara, born 6 kittens!!!!!! Ocicat Chiara meets Martin Gaus in the popular tv-programme 'The world of K3' on April 15 / Appearing of Gizmo in 'The world of K3' on April 8. Both tv-programmes can be watched on television the TROS on Nederland 3 at 8.15 am. Click here video!!!!!! 27 januari new pictures and video of the kittens, look at Ocikittens!! born 3 kittens Wizard and Brandy take a look at Ocikittens!! 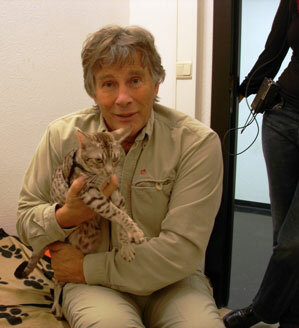 Martin Gaus tells a lot about the Ocicat, and he takes Chiara with him to show the kids and the girls of K3 how fabulous the Ocicat is. Gizmo was invited as well to act in the popular tv-programme 'The world of K3' and he plays a very important part. He is the favourite of singer Kathleen but Karen en Kristel are also crazy about him. He is a real moviestar. Behind the scenes Martin and Chiara. 26 September 2007 born kittens of Wizard and Chiara, take look at Ocikittens!! 3 August NEW slideshow cat-run!! 21 January 2006 Our stud ‘Moirai Fireworks’ we call him 'Wizard' just arrived from the United States. 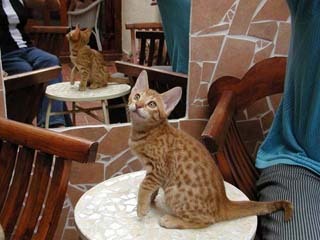 Escoburg's Susy (chocolat spotted) and Brandy (cinnamon spotted) are two Ocicat females who joins us since mid June. They are kittens from Kuttoneth Dixie Dynamite (mother) and Halifax K-Paxx (father).